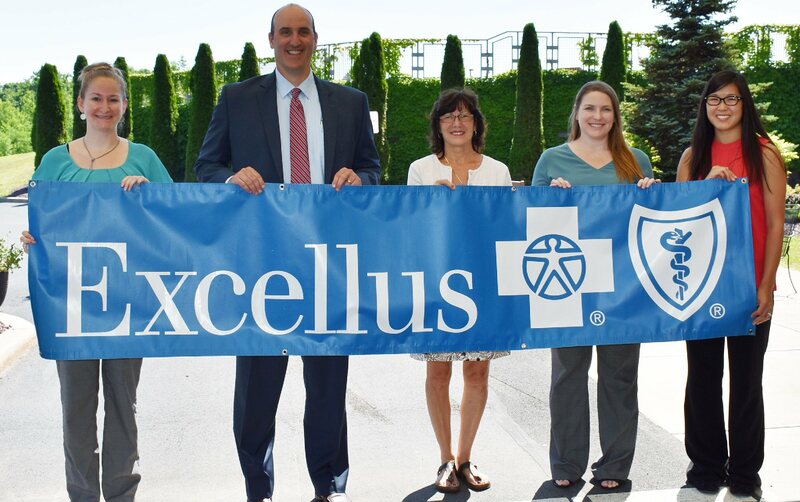 OSWEGO – Serving as the presenting sponsor for Oswego Health’s upcoming Run For Your Health 5K walk/run on August 13 that will be held on the Seneca Hill campus is Excellus BlueCross BlueShield. 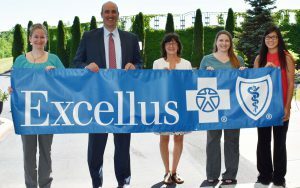 From left are Heather Huggins, committee member and activities director at The Manor; Jim Reed, regional president, Excellus BlueCross BlueShield; Lorrie Arcuri, RN, workplace wellness consultant, Excellus BlueCross BlueShield; Jennifer Martin, committee member and Oswego Health’s director of marketing; and Myia Hill committee member and Oswego Health Foundation’s development manager. The 5K run/walk will start and end at The Manor, 20 Manor Drive in Oswego winding its way through Oswego Health’s Seneca Hill campus including Springside, Oswego Health’s premier retirement living community. While the main 5K race event is at 8: 30 a.m., there will be a one-mile fun run for kids, ages four to 12 that will be held at 8 a.m. Awards will be presented to the top three overall male and female 5K finishers and the top male and female 5K finishers by age group. Timing is provided by Auyer Race Timing. There is a $30 registration fee. Individuals that register for the 5K event before July 24th will receive a free T-shirt. The kids’ fun run is free.